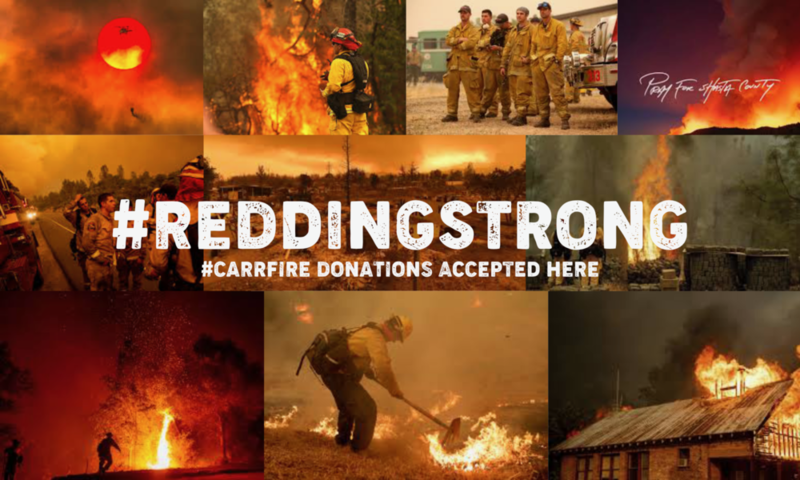 As many of you know, the Carr Fire has affected numerous families living in and around Redding. This massive, fast-moving wildfire started Monday, July 23 from a mechanical failure of a vehicle near Whiskeytown Lake on state road 299. This fire is one of the largest, deadliest and most destructive fires in California history killing seven people and destroying more than 1000 homes and 600 other structures. Fire officials have reported they have never seen a fire behave the way the Carr Fire has behaved. As of Friday morning, August 10, the fire has burned more than 181,000 acres and is 51% percent contained. Several of you have contacted us wondering how you can help. By making a donation on this page, you will be able to assist victims of the fire directly. Your donations will make a huge difference in the lives of those who have lost their homes, and 100 percent of everything you give on this page will go to those affected by the Carr Fire. We will interview victims and distribute the money we receive accordingly. Your donations are tax deductible. Thank you so much for your prayers for Redding, our beloved city. We know God has good plans for us, and we expect to see beauty arise from the ashes.